Surgical interventions on spine concerning hernias of intervertebral disks are one of the most spread interventions in neurosurgery. NLS may become one of the leading methods in diagnostics of intervertebral hernias and evaluation of their treatment effectiveness by surgical methods. Failure rate after herniated disks surgeries with progression of «failed» intervention syndrome is registered not less than in 10-40% cases. Some researchers believe that absence of effect in case of spinal surgery is registered not less than in 25% of cases. NLS-method allows obtaining reliable and visual images of vertebral bodies, spinal canal, intervertebral discs, ligamentous apparatus and soft tissues; it also reveals all changes in surgery area and shows reasons that caused unsuccessful treatment of disc herniation. The purpose of given study was clarifying lumbar spine condition after operative treatment of intervertebral hernias according to NLS data. NLS-study results of 42 patients operated for lumbar hernias were analyzed. NLS was performed in the period from 14 days to 16 years after surgery. Research was conducted due to recurring pain syndrome and occurrence of neurological symptoms in patients. Patients age ranged from 30 to 70 years; 27 women and 15 men. Patients underwent various operations: interlaminectomy (15) hemilaminectomy (12), laminectomy (6) interlaminar hernia excision (6), anterior interbody fusion by titanium implant with diskal hernia removal (3) at single (36), two or more (6) levels. NLS was performed using «Metatron»-4025 (IPP, Russia) system. «Metapathia Hospital» special-purpose software with three-dimensional visualization of surgical contact area was used. Maximum possible reduction of total research time for low tolerance adaptation of spinal patients with acute pain syndrome for long-term lying on their backs was practiced; by doing so we have received maximum complete and accurate information on nature and prevalence of pathological process with minimal loss of image quality. 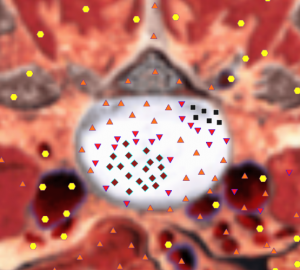 Multi-positional research conducted in 3D-mode with ultramicroscanning thus provides full information on nature of changes in all anatomical and histological structures of discovertebral unit in patients with compression nerve-root pain syndromes. Postoperative period was divided into early (6-8 weeks), intermediate (from 3 months to 2 years), late (two years or more). Analysis of lumbar spine NLS-grams demonstrated that all patients had hyperchromogenic zones (5-6 according to Fleindler’s scale) typical for epidural scarring after spinal surgery. Epidural scarring occur in all types of intervertebral hernia surgeries. It is considered that scarring develop due to post-operative hematoma. In most cases they are asymptomatic, but according to some researches in 10% of patients they envelop root, breaking its trophism and causing radicular ischemia. After surgery scar tissue may penetrate central part of the disk. According to our research, some patients must undergo NLS with ultramicroscanning once again to exclude unremoved fragments of diskal hernia, manifesting as hyperchromogenic signal zones accompanied by increased chromogeneity of NLS-signal from scar tissue (found in 2 patients). Intermediate postoperative period is optimal for determination of scarring process nature. Pic. 1. A condition after partial discotomy at LIV-LV level. Intermediate postsurgery period (1.5 years). Recurrence of lumbar spine hernias was registered in 29 patients in early and intermediate postoperative periods. NLS revealed recurrent hernia locating at level of operated disc according to «collar» type, lenticular shape and smooth contour in axial plane. Hernias at level adjacent to operated disc were diagnosed in 19 patients; adjacent and recurrent hernias were diagnosed in 10 patients. Intermediate postoperative period is optimal for detection of recurrent and residual hernias of invertebral discs. Pic. 2. A condition after surgical intervention due to herniation of intervertebral disk at LV – SI level. Intermediate postsurgery period (9 months). NLS-graphy of lumbosacral spine (sagittal plane). A recurrent posterior left intervertebral hernia is detected. 3) spinal stenosis, narrowing of intervertebral foramen in parasagittal plane. 10 of 42 patients in early and intermediate postoperative periods had inflammatory changes of vertebral bodies, adjoining intervertebral discs, fistulous tracts and paravertebral abscesses in surgery area. Spondilodiscitis was characterized by chromogeneity signal increase from bone marrow of vertebral bodies and intervertebral discs. Disruption of closing membranes and vertebral bodies, inflammatory infiltration of paravertebral tissues and epidural fiber factors were registered. NLS displayed paravertebral abscess as an irregular oval or round-shaped area of increased chromogeneity of NLS-signal, demarcated from surrounding tissues by capsule. Above-described postoperative changes in early period were mainly detected in operations such as interlaminectomy, interlaminar hernia excision and hemilaminectomy. Lamin- and hemilaminectomy were characterized by the defect in vertebral arch. NLS-signs of motor spine segment instability or spondylolisthesis found on sagittal images at median line had served as another common rule of observations in patients with expanded laminectomy in late postoperative period. Stenotic canal decompression surgery with rear access and multiple laminectomy is performed in case of spinal stenosis. Such an operation often leads to development of intradural cysts containing cerebrospinal fluid – pseudomeningocele. Surgical intervention with posterior approach and multiple laminectomy is made in case of spinal stenosis for decompression of stenotic canal. Such operation often causes formation of intradural cysts containing cerebrospinal fluid – pseudomeningocele. NLS presented pseudomeningocele as hypochromogenic signal zone (2-3 points according to Fleindler’s scale) well demarcated from surrounding tissues that reflected local fluid accumulation. Contrary to cysts, chromogeneity of signal in case of pseudomeningocele was more expressed due to high protein content. Performed research showed that NLS of lumbar spine in early, intermediate and late postoperative periods had revealed changes common for all types of surgeries: scarring changes along surgical canal, recurrence or residual hernias of lumbar spine and epidural scarring. Hypertrophy of posterior longitudinal and yellow ligaments, osteoarthritis of intervertebral joints and intervertebral foramen stenosis appeared in late postoperative period. Some operations (laminectomy, hemilaminectomy) are characterized by vertebral arch defect. Surgical intervention with posterior approach and multiple laminectomy often causes complication such as intradural cysts. Aside from that, interlaminectomy, interlaminar hernia excision and hemilaminectomy are characterized by complications such as spondilodyscitis, paravertebral abscesses and fistulous tracts. NLS-monitoring of patients after herniated disc surgeries is an effective control and timely correction method of postoperative complications. 1. Yamamoto F., Khayasi E., Abe T. Failed lumbar disk surgery reguiring a second operation: a long term follow-up study. Spine 1978; 3: 7–11. 2. Fudzito L., Khattori.A., Araki D. et al. Recurrent, postdiskectomy low back pain: NLS-surgical correlation. Am. J. Med.Clin. 2012; 151: 755–760. 3. 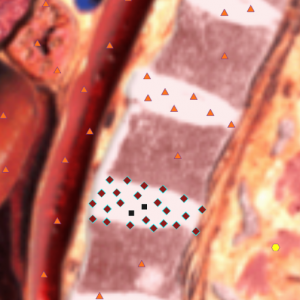 Kabamuto S., Fakui K., Oda A., Khakayava D. NLS-imaging of the postoperative lumbar spine. Med. Clin. N. Am. 2012; 28 (2): 341–360. 4. Kahn T., Quaschling U., Engelbrecht V. NLS diagnosis for degenerative changes in the spine. 2013; 44: 789–799. 5. Kaiser M.C., Ramos L. NLS of the spine: A Guide to Clinical applications. New York: Thieme, 2013. 6. Brusova A.G., Manokhin P.A., Puzanovskaya T.K., Shishkovets T.A. «NLS-diagnostics of spinal degenerative changes»// Collection of scientific works of Institute of Practical Psychophysics «Topical issues of NLS-diagnostics». Vol. I. M.: Book, 2006, p. 30-33.